The future of medicine is happening now. Revolutionary new science is providing cures that were considered science fiction just a few years ago—and not with pills, surgery, or radiation, but with human cells. Promising treatments now in extensive clinical trials could have dramatic impacts on cancer, autoimmune diseases, organ replacement, heart disease, and even aging itself. The key to these breakthroughs is the use of living cells as medicine instead of traditional drugs. Discover the advances that are alleviating the effects of strokes, Alzheimer's disease, and even allergies. Cells Are the New Cure takes you into the world of regenerative medicine, which enables doctors to repair injured and aging tissues and even create artificial body parts and organs in the lab. 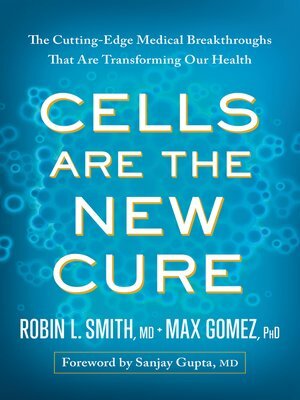 Cellular medicine experts Robin L. Smith, MD, and Max Gomez, PhD, outline the new technologies that make it possible to harness the immune system to fight cancer and reverse autoimmune diseases like multiple sclerosis, type 1 diabetes, and rheumatoid arthritis. CRISPR, a new technology for targeted gene editing, promises to eradicate genetic diseases, allowing us to live longer lives—possibly even beyond age 100 in good health. Cells Are the New Cure takes you on a tour of the most exciting and cutting-edge developments in medicine. The content inside these pages could save your life or the life of someone you love.